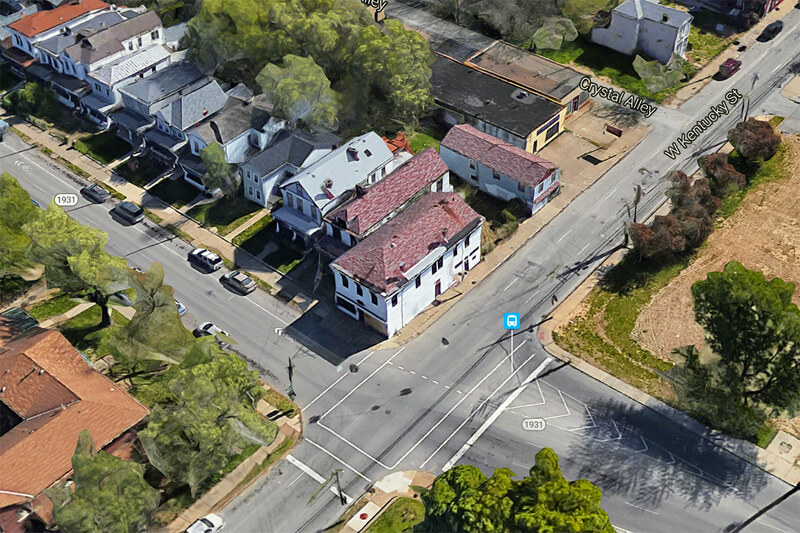 Committee votes to demolish first of three buildings at Seventh and Kentucky streets. We recently covered the plight of three century old buildings at Seventh and Kentucky streets in Limerick. Left to neglect, the properties are now in the crosshairs of the city’s codes inspectors, despite being within a landmarks preservation district. The Limerick Architectural Review Committee (ARC) had a chance to review the first of three cases on April 26, and here’s a tipster’s update from the proceedings along with notes from the meeting minutes. Initially, all three corner structures were up for demolition. Metro’s Vacant & Public Property Administration (VPPA) deferred two requests after a staff report from Planning & Design recommended denying demolition, although the structures remain threatened. The Limerick ARC unanimously approved demolition of a circa 1930s outbuilding at 621 West Kentucky. The structure had been built of low quality construction, according to P&D surveys. The committee requested augmented architectural documentation of the structure. VPPA will also move forward with foreclosure proceedings on a house at 965 South Seventh Street. That process was expected to take three to five months from the time of the outbuilding demolition. An ongoing foreclosure is already in the works on the corner building, 967 South Seventh, and VPPA is monitoring its progress. VPPA was represented by Carrie Fry. Several concerned citizens were in attendance including Dr. Daniel Vivian, Thomas Woodcock, Debra Richards Harlan, and Herb Fink. Each spoke of the irreplaceable heritage in these historic structures and what a loss a vacant parcel would be for the neighborhood. Fink lamented that his Old Louisville Property Improvement Committee was not kept up to date with the properties’ status. Harlan spoke of the neighborhood’s fragile history and how these structures cannot be replaced. Woodcock urged VPPA to be more pro-active in turning over abandoned sites before demolition enters the conversation. Vivian noted that this type of “clearance” is more expensive for the neighborhood and the city in the long run. The Limerick ARC is comprised of, alphabetically, Roberto Bajandas (not present), Dennis Lally (present), Rhonda Lawson, (not present), David Marchal (present), Stephen Peterson (present), Steve Sizemore (not present), and Jay Stottman (present). Thank you for posting this follow up. I appreciate the wryness of the article’s title. When I reported on this story I used the word *illegal* in reference to the structure facing W. Kentucky, picking up that term from an interview with an ARC member, and wow did I take some heat for that usage. This case, these properties, will be in front of us again before their fate becomes clearer.